The other day I wrote about the music block I was having. A few people passed on ideas on how to deal with it. I ended up deciding to deal with it head-on. Sunday, I sat down with my guitar & tried to make a new song. At first, it was my same old block. I watched the WWE PPV & the Fred movie. I was avoiding playing. It took me a while but I shook off that hesitant feeling & just played. I chose some odd new chords & made a song called “Woebegone”. I had a melody, a chorus & a verse (all about dealing with the block) then I got tired & went to sleep. The story could’ve ended there. But tonight, Jill (my gf) & I had nothing to do so we decided to go to Sidewalk’s Open Stage again. In wild abandon, I decided to play the song. I wrote 2 more verses & went for it, without having ever played it. I figured if I continue to hesitate, I’ll never get started again. Was it a perfect performance? Heck no (pretty good for a first time though) but it made me wanna play more. Hooray for progress. It’s a landmark day, however small it is. Today, I handed my first lyric to Chris, Ken and John for Gatecrasher. Over the last month, this has all been conceptual. Now, the project is beginning to move forward. I feel good about this song. It’s the beginning of Gatecrasher’s tale. I know that I’m going to have to do some prose to go along with the album to make it really cohesive but I like the way the story is coming along through the songs. The songs are a little abstract and that’s something I’ve struggled with in the past. I like filling in all the blanks for the reader/listener and if you take just the songs on their own, you may not get the entire story and I’m fine with that. That’s why I’ll write some prose and do some videos. Bit by bit, the story will unfold until you get an entire piece. It’s not the usual way that I work and I couldn’t be happier for that fact. Tomorrow, I hope to give the band another lyric while I work on the other 8. If I can get into a groove, I know I can churn the words out. I just have to get into that groove. Finding the creative trigger can be the hardest part sometimes. Audioshards’ main focus is to chronicle the journey of making my new album, Gatecrasher. So, for my first diary entry, a little background story. The road to making this album started with some odd feelings about some successes. Every February, I team up with the members of the Berkeley Social Scene and we combine forces like Voltron and become the mighty Zinkline. Zinkline then releases an album for the FAWM. In 2007, we made an album called “Bending the Worlds”. The next year, I decided to write a concept album. The album was called “Grace of a Car Crash” and told the tale of a political assassination that leads to a nuclear war. Zinkline enjoyed doing the concept album idea the first time, we embraced it again in 2009. We did an album all about various board games. “Zugzwang” included songs inspired by Monopoly, Operation, Settlers of Catan and various others. We stuck with the concept album idea this year and made “Little Cuts”, an album full of songs inspired by various phobias. The thing about “Little Cuts” was, despite it being an excellent album, it wasn’t what I had envisioned. Some of the songs went in directions, I hadn’t expected. I wrote very dark and moody tunes, the bands decided to play them with contrasting bright melodies. And that’s when the strange feeling came over me. These were songs that I had written but I didn’t take part in the music making. I was the words, BSS were the sound. As a lyricist, you hand your work to others to manipulate. I suddenly found myself wanted more because I may have been happy to have a band as talented as BSS turning my words into songs, I wanted a bigger piece of the pie. The first thought was make an album myself. I would delve into my usual world of acoustic guitars and dark songwriting. Then I came to the realization that the narrow range of my musical acumen would not suffice if I wanted to create the album that was in my head. So, what did I do? I decided to put down the music for a little while and focus on my writing. Back in November, I had succeeded at my first NaNoWriMo. I wrote a story called Dead End 94, all about a group of ghost hunters. I love serials and I wrote Dead End 94 with the clear intent to write several sequels. I started going over the story and found that I didn’t have the drive. I was creatively lost for quite a while. Then my girlfriend Jill & I got the idea of starting a blog where I would write a serial. The serial would be called Gatecrasher and have to do with opening a gate to a parallel universe. The initial blog fell apart and I tried to write Gatecrasher as stand alone prose. It didn’t feel right. Then I got the idea to write Gatecrasher as songs. I wrote the first song, currently titled “Dead of Night”, and everything clicked into place. I knew that this was going to be an album. But I was still left with the question of how to get it to sound the way I envision. Lucky for me that I know a bunch of great musicians. I asked my friends if they would be interested in helping me and put together a four piece band: Chris on guitar, Ken on drums, John on bass and I’m handling vox. The band is going to try making three songs to see if this foursome clicks. Chris has been great with listening to my ideas and trying to make them happen. I love the fact that I’ve got him listening to Made Out of Babies to get a sense of where my head is musically. Right now, we’re really at the beginning stages. I’m writing the lyrics for the 10 songs that will make up Gatecrasher’s story and I’m only 2 songs in. The album isn’t the whole thing. Gatecrasher needs to be something more. To tell the story, I need more. Chris suggested music videos and that thought was already in my head. There needs to be a greater presentation. But that’s way down the road. And I’m excited to see where Gatecrasher’s Road takes me. Hello to all those who stumble across this blog. 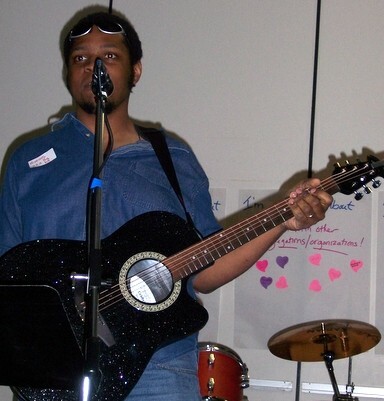 My name is Niveous and I’m a musician from New York/New Jersey. Over the last few years, I have done a lot of work with music online. I’ve been an active part of the Songfight music community and I run a pair of music competitions- Nur Ein and the Gift of Music. It’s been a great experience and has allowed me to interact with a lot of great musicians. One thing that I haven’t done a lot of recently is my own music. In the last three years, I’ve done a lot of songwriting for other bands but I haven’t pushed the limits of my own work. It’s finally time to try. I’ve decided to blog about the whole experience of trying to create a new album. Up until earlier this month, I ran a blog on livejournal called 10kdays where I talked about a different song every day and that was a lot of fun to do but life often got in the way. Now, in the midst of a brand new life, I wanna write again. Here on audioshards, you’ll hear about my perspective on the creative process, as well as my feelings on the world of music. Will life get in the way of a new album? Will it be the album I always dreamt of? Will everything go in the direction I could never have dreamt of? We’ll find out.